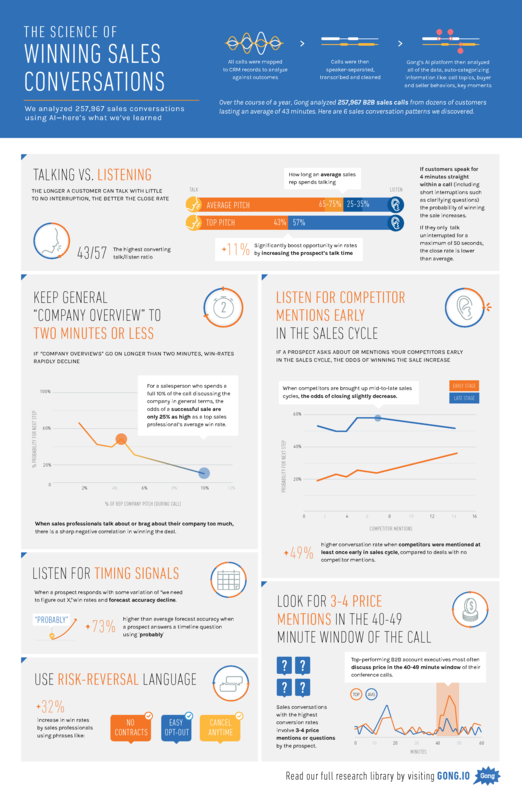 How to make successful sales calls is a universally asked question and here we provide some answers. Whether this is their first call, the call to close the deal or somewhere in between, having a planned structure and script, for every stage of the sales funnel, improves your chances of sales success. Detours along the way are bound to happen but putting a structure in place before you dial is like empowering yourself with GPS to calibrate the best route to get to your desired destination, which in this case is your next follow-up call, face-to face meeting or live demo. Be warned though that this approach relies heavily on research and reliable intel that prompts a ‘this person really gets me’ reaction. Reading the linguistic cues and timing signals of your prospects is also important. These are indicative of how ready they are to take the next step. Identify from your previously recorded sales calls what specific terms, phrases and words hint an increased likelihood of a purchase. Keep this list handy during the call itself so you can get the timing of your pitch just right. 73% higher than average forecast accuracy when a prospect answers a timeline question using ‘probably’. If they apply to your business, also mention easy opt-out options and language that mitigates that risk. Sales professionals who use risk reversal language such as talking about opt-outs, guarantees, and SLAs, increase their sales win rates by 32% on average. As a general rule, the longer you go without interrupting your customer, the better, as this gives them the time and opportunity to reveal more about themselves. Paraphrasing back to themis a great way to show you are listening and care about their needs. A great sales rep always builds rapport, which customers appreciate as it paves the way for two-way, mutually beneficial conversations instead of being ‘sold to’. No prospect likes to be be ‘talked to’ and being’ talked at’ is even worse as this could come off as condescending while you obliviously lecture rather than educate them about your company. It’s important to practice what you plan to say so that you iron out any failings in tone, pitch and volume. Learn to enunciate well to avoid any unnecessary misunderstandings. Speak calmly, confidently and in a steady, measured manner. Show your enthusiasm and hold their interest with your voice as this reinforces your message. Great communicators know it helps to identify and mirror the style of the person they’re speaking with, and also project the positivity they want mirrored back to them. Personality projection is a great tool that works towards increased close rates. Only 18% of buyers will buy from a salesperson who doesn’t match the buyer’s personality type vs. 82% when personality types are aligned. Make a mental note to not lead with price as as the cornerstone of your pitch. If your focus is on price rather than value, the competition can always undercut you. To close the deal remember that patience pays and mentions of cost can wait. Let the benefits of your offer take the the limelight instead. The above blueprint helps, no matter the level of experience your sales reps, as it is a holistic strategy. Your most experienced rep can learn something new here while the rookies on your team will find a great place to start when they begin to customize their sales scripts. With a plan and structured sales calls, the incremental learning from every additional conversation is what sets you up for success.